(a) Schematic diagram of the microfluidic channel used for ZnO NPs synthesis. Microfluidic channels included preheating, mixing, and synthesis regions, with two inlets and one outlet. (b) A deep reactive ion etched microfluidic channel with an anodic bonded glass cover. A micro fluidic system for ZnO NPs synthesis was fabricated by applying deep reactive ion etching (DRIE) techniques to a silicon substrate. The microchannels were 200 mm wide and 200 mm deep. The initial DRIE process generated the 200 mm deep channels. The silicon substrates containing the microchannels were then anodically bonded to a glass coverslip. As shown in Fig. 1a, the channels formed three distinct regions to allow for preheating, mixing, and synthesis, with two inlet ports and one outlet port. A photograph of the fabricated microchannels is shown in Fig. 1b. The synthetic process proceeded by injecting chemical reagents into the inlet ports directly connected to the preheating region. The 92.5 mm-long preheating region functioned both to preheat and to stabilize the reagents. The preheated reagent flows converged at the consequence of the mixing region. After completion of mixing, the mixed reagents flowed into a 341.5 mm-long synthesis region where the chemicals reacted under uniform heating conditions. After reacting, the reaction solution was then collected in a reservoir via the outlet port. The computational domain of the simulation is shown in Fig. 2. The T-shape microchannel indicates the consequence at the mixing region. The system coordinates were positioned such that the origin was located at the center of the two inlet branches, the streamwise direction of the outlet branch was oriented along the X-axis, the direction perpendicular to the outlet branch was oriented along the Y-axis, and the lateral direction of the channel was oriented along the Z-axis. The y-directional distance between the two inlets was 3 mm, and the x-directional distance from the consequence and the outlet was 7 mm. The width and height of the microchannel were each 200 mm. The flow rates of the NaOH and Zn(OAc)2 solutions were 0.855 mL min_1 and 1.645 mL min-1, respectively. After consequence, the total flow rate was 2.5 mL min-1, with a mean velocity of 10.42 mm s-1. This flow rate was determined by calculating the maximum theoretical flow rate under an expected total pressure drop (△Ptotal) of less than 20 kPa for a stable process. The total pressure drop was calculated from the sum of the pressure drops in the first preheating region △Pph1, second preheating region △Pph2, mixing region △Pmixing, and synthesis region △Psynthesis as follows, △Ptotal = △Pph1 + △Pph2 + △Pmixing + △Psynthesis. Numerical simulations of the pulse mixing system. (a) 1 Hz, (b) 3Hz, and (c) 5 Hz. The contours indicate the mass fraction of the Zn(OAc)2 solution. The results show that the measured z potential values were 31.3 eV (24 h) to 10.3 eV (330 h) and 28.7 eV (24 h) to 2.39 eV (330 h) for micro fluidic and batch processed syntheses respectively. A low z potential value indicates high flocculation tendency in a colloid.34,35 From this point of view, the micro fluidic synthesized ZnO NPs have more stable electrical and storage properties than batch process synthesized ZnO NPs; this shows the advantages of the micro-fluidic synthetic system and their high potential for practical applications. 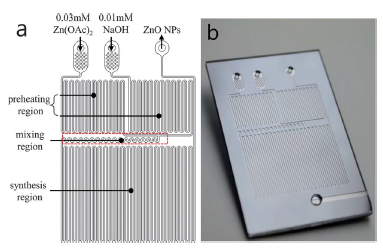 To measure the performance difference of synthesized ZnO NPs in electrical device applications, bulk heterojunction organic photovoltaic (OPV) cells with an inverted configuration were tested with the 330 hours stored ZnO NPs as an electron transporting layer. The OPV cells were fabricated using the following built-up sequence of thin layers on the indium tin oxide (ITO) coated glass (15 U sq_1): 80 nm of ZnO NPs, 400 nm of P3HT:PCBM, 1 mm of PEDOT:PSS (hole transporting), and 1 mm of Ag. In Fig. 8c, the current density–voltage characteristics of the devices under 100mWcm_2 of AM 1.5 illumination are presented. The power conversion efficiency (PCE) of the OPV with micro fluidic synthesized ZnO NPs was 1.67%, higher than the PCE of the OPV with batch process synthesized ZnO NPs (0.09%). In addition to the PCE, the open circuit voltage (VOC), short circuit current (JSC), and fill factor (FF) values also show that the micro fluidic synthetic ZnO NPs based OPV has higher performance than the batch process synthesized ZnO NPs based OPV. These results show that the micro fluidic system has advantages to maintain the characteristics of synthesized ZnO NPs and its applications, and guarantees the good preservability and performance. We anticipate that a micro fluidic system and flow control technique will be applicable to more functional nanomaterials synthesis and present economic and environmental benefits through mass production plant systems with closed reaction conditions. 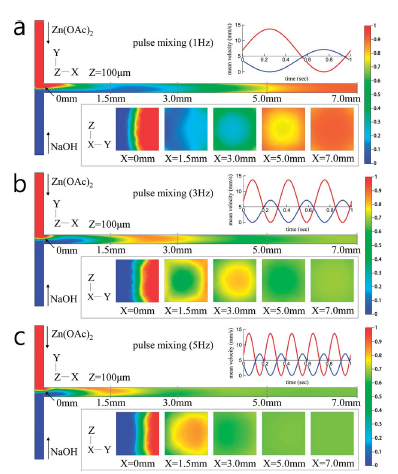 Transmittance and zeta potential values of ZnO NPs ethanol solutions depending on the storage time after synthesis (24 or 330 hours): (a) microfluidic synthesis, and (b) batch-process synthesis. 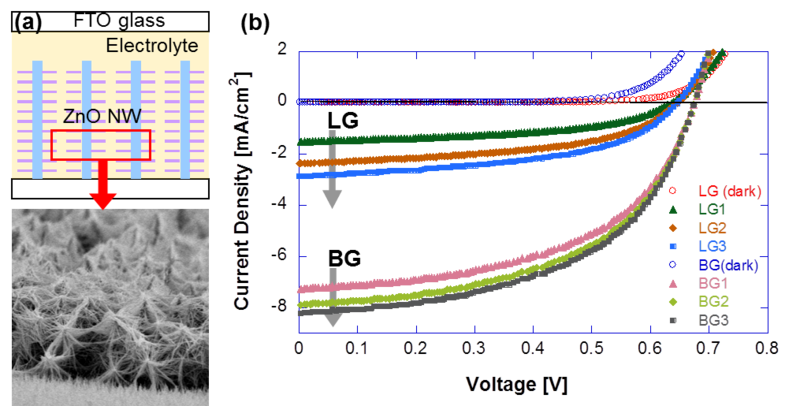 (c) Current density versus voltage results for fabricated organic photovoltaic cells with synthesized ZnO NPs. 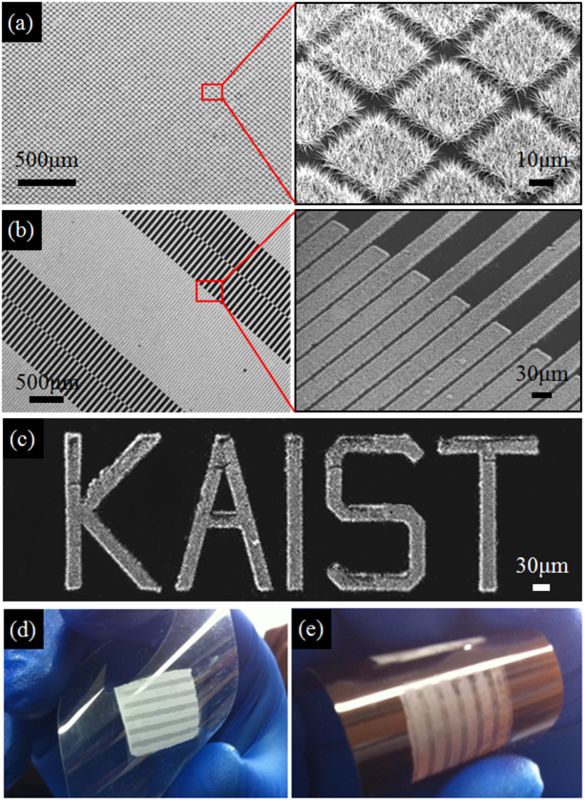 · To assess the possibility of high-performance electronic applications of the patterned ZnO NWs, their field emission characteristics were examined by fabricating a high-performance field emission device with a patterned ZnO NW array. Schematic diagrams of the ZnO NW patterned growth process: the direct printing of the ZnO NP seed layer and subsequent low-temperature ZnO NW hydrothermal local growth on the printed ZnO NP seeds. (a) μCP stamp preparation: elastomeric polymer (PDMS) stamp replication from a SU-8 pattern prepared with conventional photolithography and oxygen plasma surface treatment. 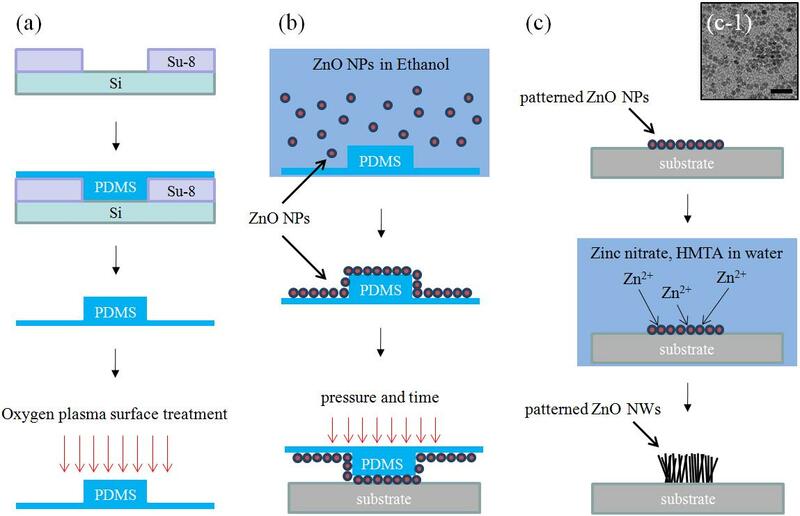 (b) ZnO NP seed layer patterning: the adhesion of ZnO NPs to the PDMS stamp surface and subsequent transfer (printing) to the target substrate. (c) ZnO NW local growth: the hydrothermal growth of patterned ZnO NWs on the previously printed ZnO NP seed pattern from an aqueous solution containing zinc nitrate hydrate, HMTA and PEI. (c-1) TEM image of ZnO NP seeds (scale bar = 15 nm). SEM images and photographs of ZnO NW patterned growth. Large-area ZnO NW local growth on (a) a square pattern array (area 30 x 30 μm2 and pitch 5 μm), and (b) an interdigitated line pattern array (line width 30 μm with pitches 5 μm in the dense region and 40 μm in the coarse region). The images on the right show magnified views of the regions enclosed in red boxes (a-b). (c) SEM image of ZnO NW local growth on an arbitrary letter pattern, “KAIST”. Digital photographs of ZnO NW patterned growth on plastic substrates ((d) PET film and (e) PI film). The stripes result from the difference in pattern density (d-e). ZnO NW arrays fabricated with two different printing times. A ZnO NW array with a printing time of 60 s: (a) top view and (b) 45° tilted view of the ZnO NW array grown vertically from ZnO seed NPs printed with a flat PDMS (no pattern) stamp. A ZnO NW array with a printing time of 30 s: (c) top view and (d) 45° tilted view of the ZnO NW array grown hemispherically from ZnO seed NPs printed with a flat PDMS stamp. The images in the insets show magnified views of the individual “needleleaf-like” ZnO NW arrays indicated by the red circles. (e) Top view and (f) 45° tilted view of a ZnO NW patterned growth array obtained from ZnO seed NPs printed on a PDMS square pattern with a printing time of 60 s. The spacing between the adjacent NW array elements is 5 μm. The printing pressure was maintained at 0.03 psi in all cases. 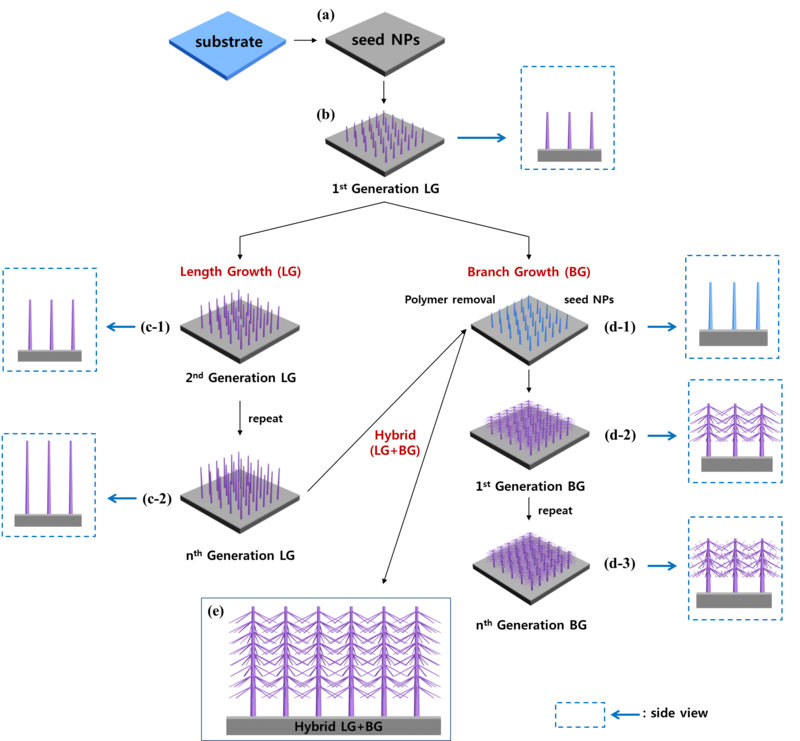 (a) A schematic illustration of a field emission device with a patterned ZnO NW array. (b) A luminous field emission device with a patterned ZnO NW array. 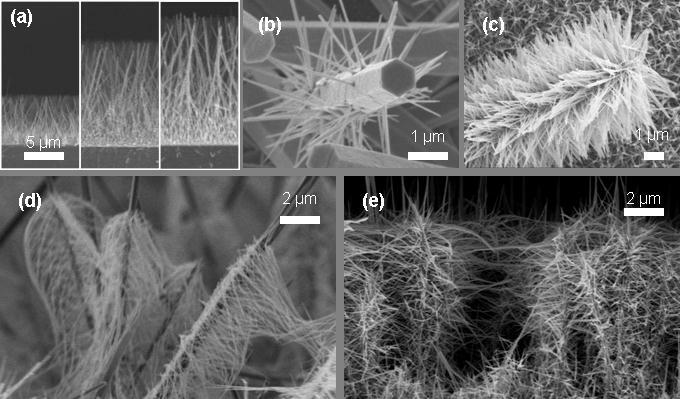 (c) SEM images of two adjacent “needleleaf-like” ZnO NW arrays (the enlarged image shows the opposing ZnO NWs). 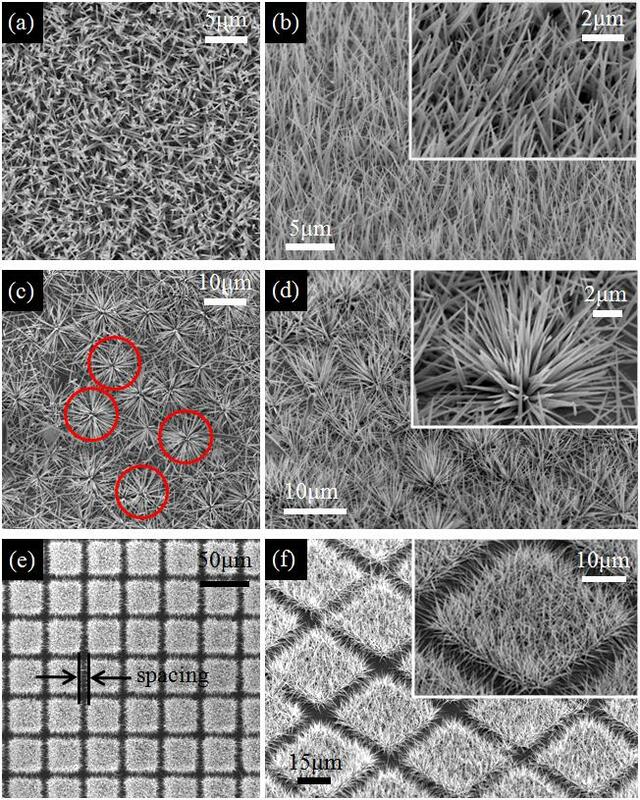 SEM images of the edges of square ZnO NW patterned growth with (d) 5 μm spacing and (e) 20 μm spacing. The control of the ZnO NW geometries by varying the printing conditions (time and pressure) and the hydrothermal reaction time was successfully demonstrated. By using this control of pattern geometry and printing time, radially grown ZnO NW structures were created for use in the fabrication of an efficient field emission device. The optimum patterned ZnO NW field emission device fabricated with the current approach was found to exhibit a very low turn-on electric field value (1.60 μmV-1), which is attributed to the decrease in the field emission screening effect that results from the radial structures of the micro-patterned ZnO NW arrays. 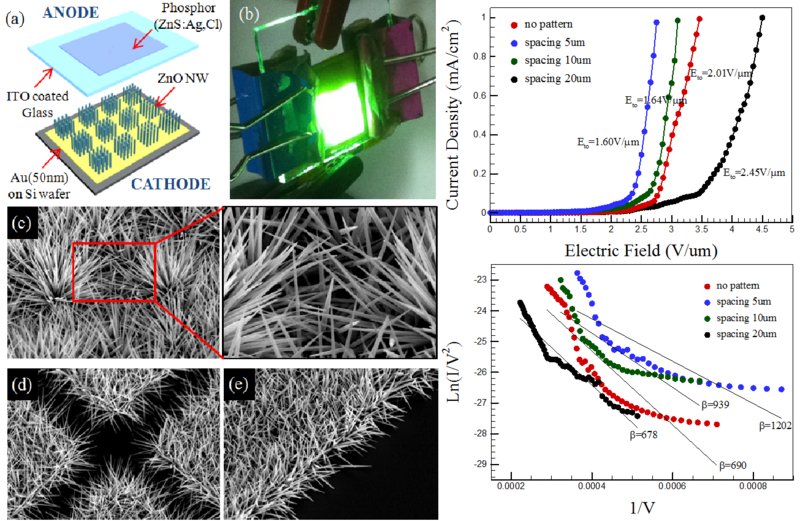 · To increase the power conversion efficiency in dye-sensitized solar cell, we developed “nano-forest” of high density, long branched “treelike” multi generation hierarchical ZnO nanowire photoanodes grown via a simple selective hierarchical growth approach. SEM pictures of ZnO NWs. (a) Length growth (1,2,3 times growth). “Seed effect”: first generation branched growth (b) without seeds and (c) with seeds after polymer removal. “Polymer removal effect”: first generation branched growth (d) without polymer removal and (e) with polymer removal after seed NP deposition. Polymers on ZnO NW are removed after 350°C heating for 30 minutes. 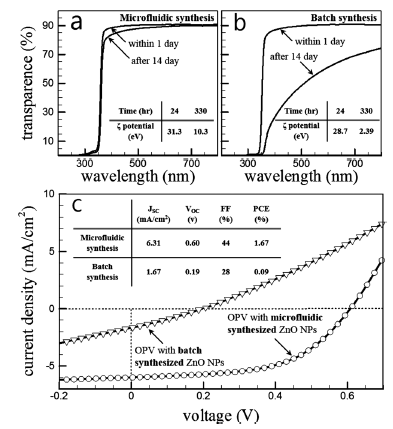 Schematic structure and IV curve of dye-sensitized solar cell with “nano-forest” ZnO NW.